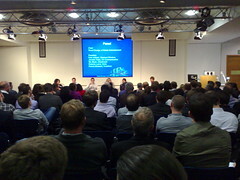 Mobile Monday London: Location Event Packs CBI! If not the biggest MoMo London ever it was at least one of the biggest MoMo Londons ever. We had people standing and sitting in the aisles at CBI Conference Centre with over 220 people showing up to hear the latest and greatest on location, hosted by Skyhook Wireless. Our aim for this event was to take a fresh look at the location services topic, focusing on newly emerging platforms and mobile applications that are using location in new and innovative ways. Special thanks to Stuart Dredge from Mobile Entertainment for leading our panel discussion and to our panelists Nic Black from Cloudmade, Jennifer Hicks from Ink Communications, Kate Imbach from Skyhook, Roberta Lucca from Vertu and Patrick Weissert from Vodafone. Thanks also to our great demoers from Flook, Shazam and Vodafone! Coverage of the event included a great article from Stuart, posts from Bena Roberts on GoMo News, from Anna Gudmundson, from Ben Morris at Samsung Mobile Innovator and a thorough write-up from Adam Cohen-Rose.